home / Multimedia / The Holy Land in videos / The Italian Minister of Justice makes a visit to the ..
With Fathers Eugenio Alliata, Father Ibrahim Faltas and Father Luis García serving as guides, on 26 October a special visit took place to the Church of Gethsemane, and to the ATS pro Terra Sancta project being carried out there. 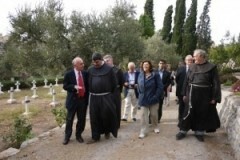 The Italian Minister of Justice, Paola Severino, along with a delegation of advisers and the Italian Consul General in Jerusalem, Giampaolo Cantini, passed through the Garden of Olives in order to see the domed mosaics of the church, where restoration activities are under way. After meeting the young people who are learning – by means of a long training course – the art of mosaics, the delegation went up to the Garden above the church, and in front of the walls of the Old City of Jerusalem the Minister offered her reflections on the value of a project such as the one in Gethsemane: “In all of the histories of persecutions, culture has served as an aid for survival, and it is my hope that culture and beauty can serve as a spur to help overcome the current crisis, for us in the West as well”. In addition to preservation and restoration activities, the Gethsemane project provides for the participation of the local population, through training young mosaicists and organizing activities and guided visits for local schools. In addition to ATS pro Terra Sancta and the Custody of the Holy Land, the project is supported by the Italian Consulate PMSP (Palestinian Municipalities Support Program), the Mosaic Center of Jericho, the Municipality of Rovereto in Italy, the Opera Campana dei Caduti Foundation, and the Fondazione Cassa di Risparmio di Trento e Rovereto (Savings Bank of Trento and Rovereto). 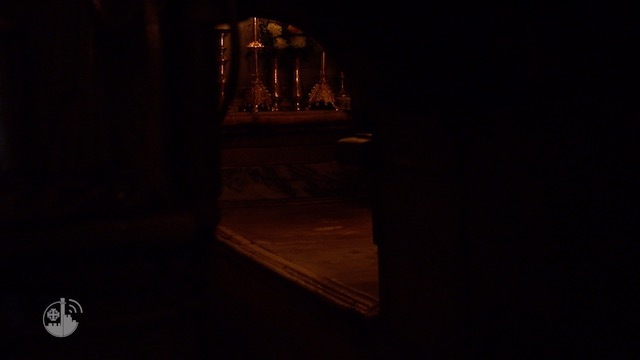 Watch the video produced by the Franciscan Media Center about the Gethsemane’s project!